You can book your seat and get event ticket. Bookings will not be confirmed until you fill the form so hurry up and get yourself registered for the 3 D Printing paid workshop. Address: Plot No 12, First Floor, Hargobind Enclave, Karkardooma, Anand Vihar, New Delhi, Delhi 110092. 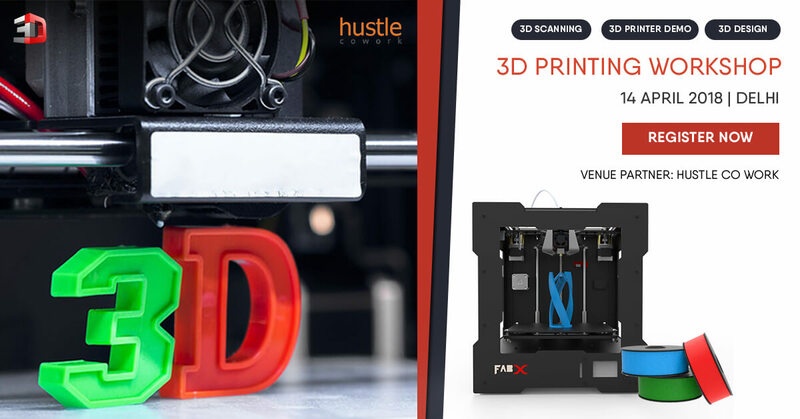 The proposed event is a One-Day 3D Printing Workshop covering the basics of 3D Printing, 3D Scanning & related topics with some engaging hands-on sessions in between. The takeaway would be a high level overview of 3D Printing and the right amount of technical aspects to get started with 3D Printing. The workshop would cover a complete cycle of processes from Scanning or Designing an object to 3D Printing it, with technical details to all stages in between.